By Dainis in Blogging. Updated on November 20, 2017 . Without a doubt Google is one of the largest company in the technology industry and the largest influencer on the Internet. We use Google product and services on daily basis, and some us are depend on it so much that if any of the services are down, we become helpless, resulting things to be put on halt. Using Google services and following the news & updates are equally important. Almost every Google services (excluding the ones in Google lab) have a blog and that’s where the staffs update us on latest development, maintenance, future enhancement and a whole lot more. Sure, some of us might argue that we can get updates from newsletter, but keep in mind newsletters aren’t frequent and if you compare to what you can get in the blog, newsletters merely summaries. In this article, we sum up a list of Google products’ blogs we generally used and we categorize them by different professions so you can get an overall view what you are likely interested. We’ve also added the hyperlinks to both the blog and RSS feeds so you can subscribe at ease. Hope you’ll find it useful. 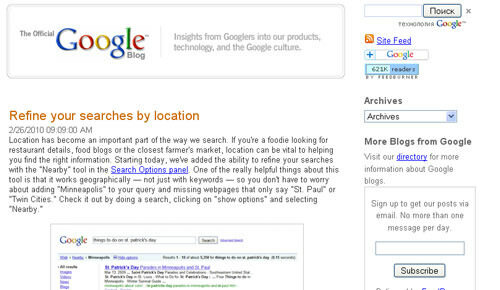 Google Search Engine | Blog | RSS FeedGoogle search is a web search engine owned by Google Inc. and is the most-used search engine on the Web. Google Search provides more than 22 special features beyond the original word-search capability. Google Earth | Blog | RSS FeedGoogle Earth lets you fly anywhere on Earth to view satellite imagery, maps, terrain, 3D buildings, from galaxies in outer space to the canyons of the ocean. You can explore rich geographical content, save your toured places, and share with others. 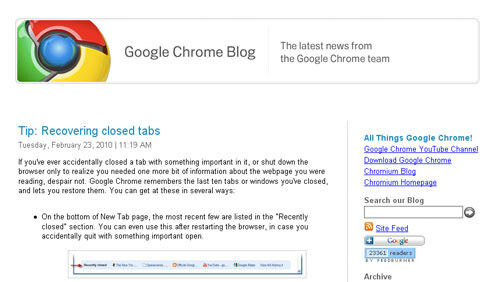 Google Chrome OS | Blog | RSS FeedGoogle Chrome is an open source web browser based on Webkit and powered by Google Gears. 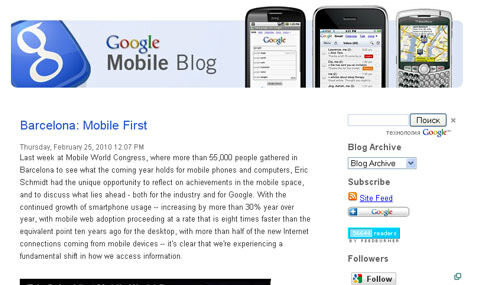 Google Mobile Products | Blog | RSS FeedGoogle company have several products for mobile phones, like Blogger Mobile, Buzz, Gmail, iGoogle, Mobile search, Google latitude. These products can be accessed through a browser on a mobile device or a standard desktop web browser such as Firefox. 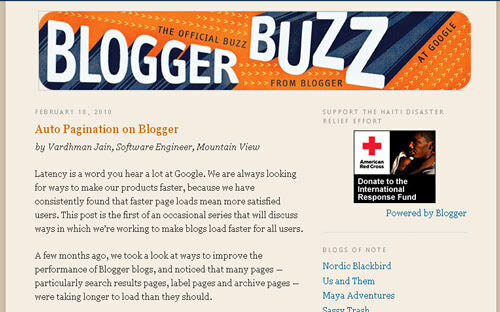 Google Blogger | Blog | RSS FeedBlogger is a blog storage service that allows private or multi-user blogs with time-stamped entries. The blogs are hosted by Google at sub domains of blogspot.com. 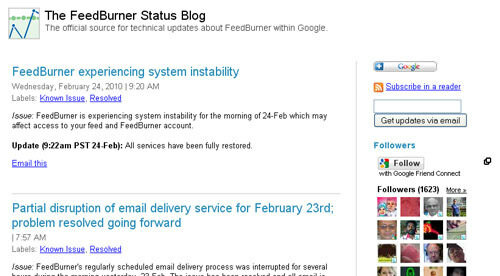 FeedBurner | Blog | RSS FeedFeedBurner is a web feed management provider. FeedBurner provides custom RSS feeds and management tools to bloggers, podcasters, and other web-based content publishers. 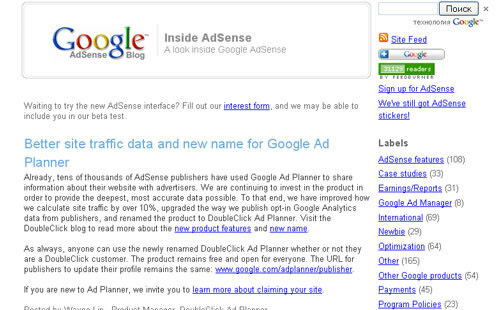 Adsense for Feeds | Blog | RSS FeedOne more blog for freedburner users. 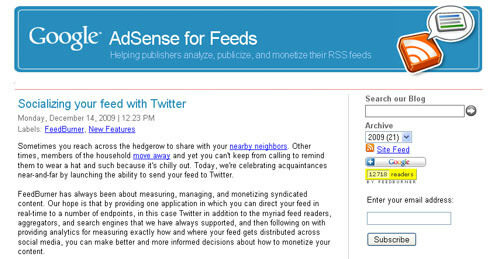 With adsense for feeds publishers can analyze, publicize and monetize rss feeds. 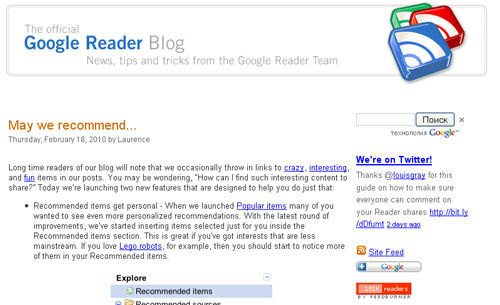 Google Reader | Blog | RSS FeedGoogle Reader is a Web-based aggregator, capable of reading Atom and RSS feeds online or offline. Google Adsense | Blog | RSS FeedAdSense is an ad serving application run by Google Inc. Website owners can enroll in this program to enable text, image, and video advertisements on their websites. These advertisements are administered by Google and generate revenue on either a per-click or per-impression basis. Google Adwords | Blog | RSS FeedAdWords is Google’s flagship advertising product and main source of revenue. AdWords offers pay-per-click advertising, and site-targeted advertising for both text and banner ads. 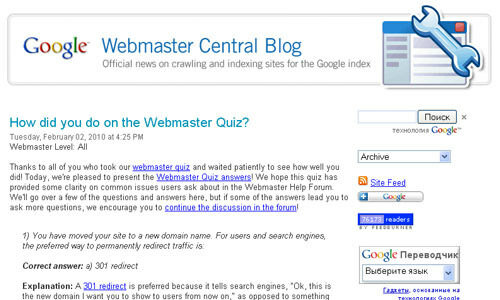 Google Webmaster Central | Blog | RSS FeedGoogle Webmaster Tools is a no-charge web service by Google for webmasters. Google webmaster tools will helps your about crawling and indexing questions, introduce you to offerings that can enhance and increase traffic to your site, and connect you with your visitors. Google Checkout | Blog | RSS FeedGoogle Checkout is an online payment processing service provided by Google aimed at simplifying the process of paying for online purchases. Google Checkout allows buyers in over 140 countries to purchase goods and services using a credit or debit card through Google Checkout checkout process. 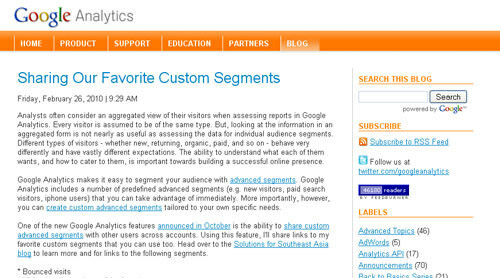 Google Analytic | Blog | RSS FeedGoogle Analytic is the enterprise-class web analytics solution that gives you rich insights into your website traffic and marketing effectiveness. Powerful, flexible and easy-to-use features now let you see and analyze your traffic data in an entirely new way. Google Apps | Blog | RSS FeedGoogle Apps is a service from Google for using custom domain names with several Google products. It features several Web applications with similar functionality to traditional office suites, including: Gmail, Google Calendar, Talk, Docs and Sites. 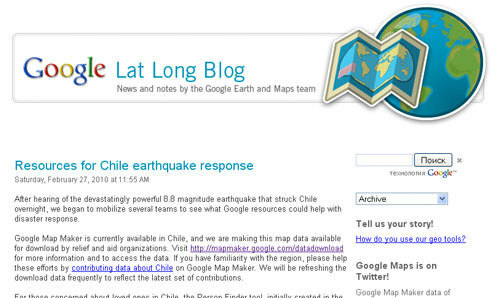 Google Sites | Blog | RSS FeedGoogle Sites is the easiest way to make information accessible to people who need quick, up-to-date access. People can work together on a Site to add file attachments, information from other Google applications, and new free-form content. 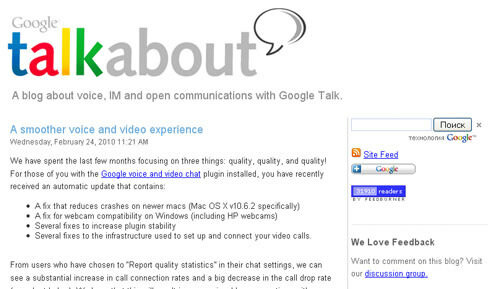 Gtalk | Blog | RSS FeedGoogle Talk is a free Windows and web-based application for instant messaging and voice over internet protocol, offered by Google Inc. Gtalk blog is blog about voice, IM and open communications with Google Talk. Google Friend connect and Buzz | Blog | RSS FeedGoogle Friend Connect is an online service by Google that allows users on the internet to connect with their friends on different websites. Google Buzz is pretty new Google product. 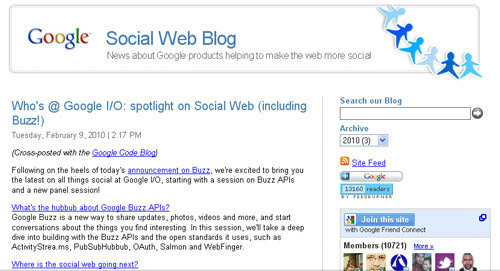 Buzz is a social networking and messaging tool from Google, designed to integrate into Gmail. Using Buzz peoples can share links, photos, videos, status messages and comments organized in “conversations” and visible in the user’s inbox. 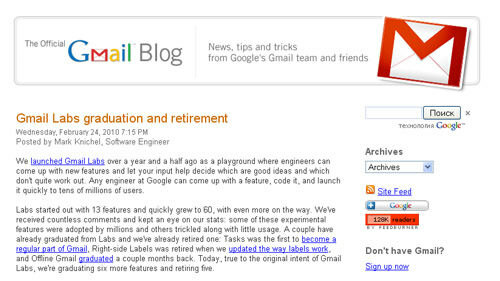 Gmail | Blog | RSS FeedGmail blog is free webmail IMAP and POP e-mail service provided by Google, known for its abundant storage and advanced interface. Gmail has a search-oriented interface and a “conversation view” similar to an Internet forum. 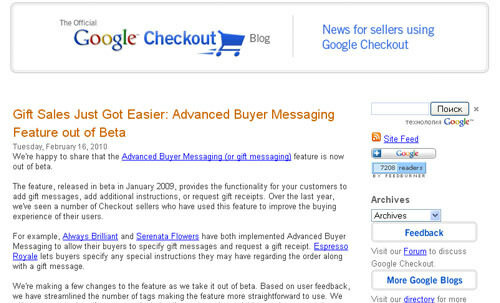 From February 9, 2010 in Gmail is integrated Google new product Buzz. 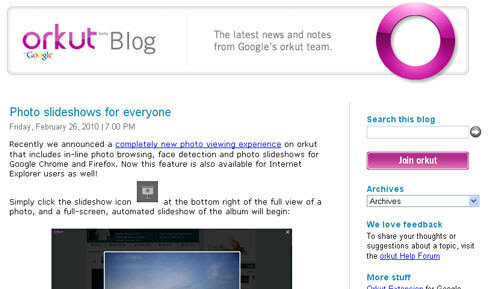 Orkut | Blog | RSS FeedAn online community designed to make your social life more active and interesting. Social Network orkut help you maintain existing relationships with pictures and messages, and make new friends, getting acquainted with people you’ve never met before. 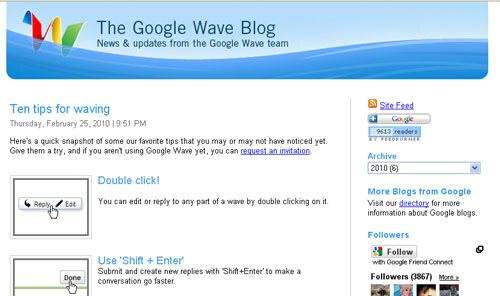 Google Wave | Blog | RSS FeedGoogle Wave is an online tool for real-time communication and collaboration. A wave can be both a conversation and a document where people can discuss and work together using richly formatted text, photos, videos, maps, and more. 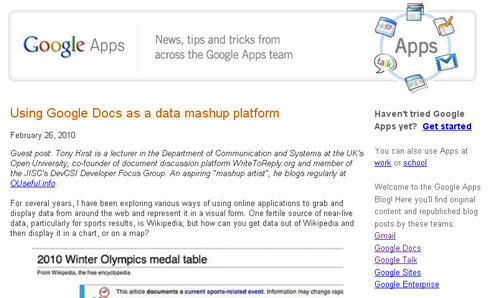 Google Groups | Blog | RSS FeedGoogle Groups is all about helping users connect with people, access information, and communicate effectively over email and on the web. 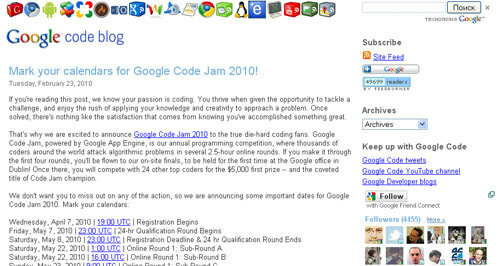 Google Codes | Blog | RSS FeedGoogle Code is Google’s site for developer tools, APIs and technical resources. 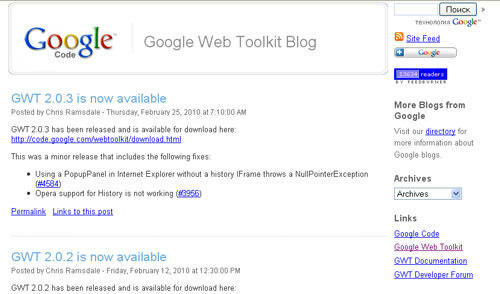 Google Web Toolkit | Blog | RSS FeedGoogle Web Toolkit is a development toolkit for building and optimizing complex browser-based applications. Google Web Toolkit is used by many products at Google, including Google Wave and Google AdWords. 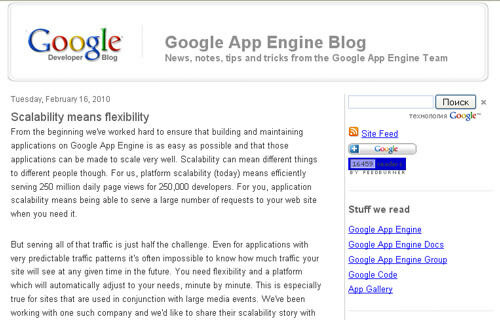 Google App Engine | Blog | RSS FeedGoogle App Engine is a platform for developing and hosting web applications in Google-managed data centers. 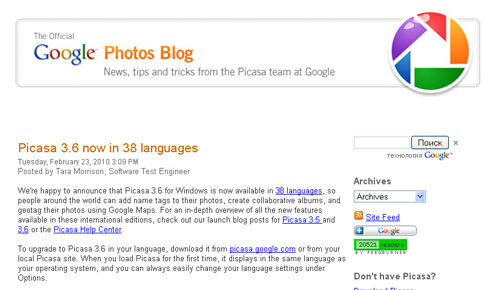 Picasa | Blog | RSS FeedPicasa is a software application for organizing and editing digital photos. Picasa offers several basic photo editing functions, including color enhancement, red eye reduction and cropping. Youtube | Blog | RSS FeedYouTube is a video sharing website on which users can upload and share videos. YouTube display a wide variety of user-generated video content, including movie clips, TV clips, and music videos, as well as amateur content such as video blogging and short original videos. 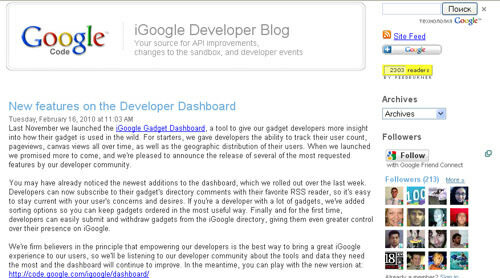 iGoogle Developer | Blog | RSS FeediGoogle is Google’s personalized homepage that users can customize with the information and tools they use everyday. You can now develop richer gadgets with large canvas views and social features to make your content more engaging and useful. 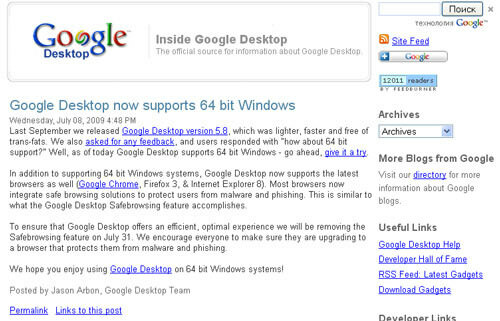 Google Desktop | Blog | RSS FeedGoogle Desktop makes searching your computer as easy as searching the web with Google. It’s a desktop search application that provides full text search over your email, files, music, photos, chats, Gmail, web pages that you’ve viewed, and more. 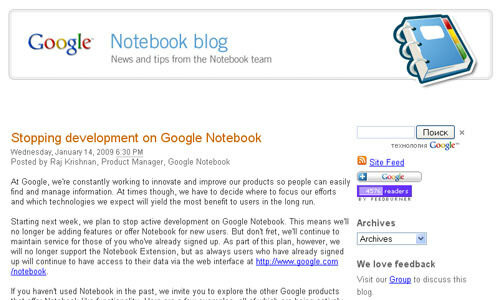 Google Notebook | Blog | RSS FeedWith Google Notebook, you can browse, clip, and organize information from across the web in a single online location that’s accessible from any computer. The browser-based tool permits a user to write notes, clip text and images, and save links from pages during a browser session. 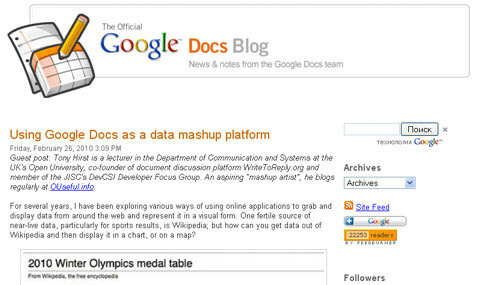 Google Docs | Blog | RSS FeedGoogle Docs is a free, Web-based word processor, spreadsheet, presentation, form, and data storage service offered by Google. It allows users to create and edit documents online while collaborating in real-time with other users. 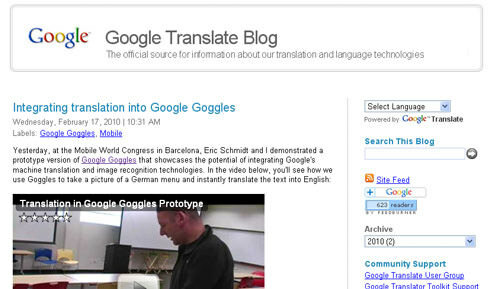 Google Translate | Blog | RSS FeedGoogle Translate is an automatic translator – that is, it works without the intervention of human translators, using state-of-the-art technology instead.